The “American Recorder Rally” is on! Working with up to twelve ARS Recorder Orchestras and Chapters around the country, Maute has created a large-scale concert program. The project, sponsored in part by the American Recorder Society, is designed to give players of intermediate level and above an opportunity to perform Maute’s newly composed Concerto for Recorder Orchestra and Recorder under the composer’s guidance and leadership. Mr. Maute directs participants in a two-hour rehearsal, with a performance the same day. 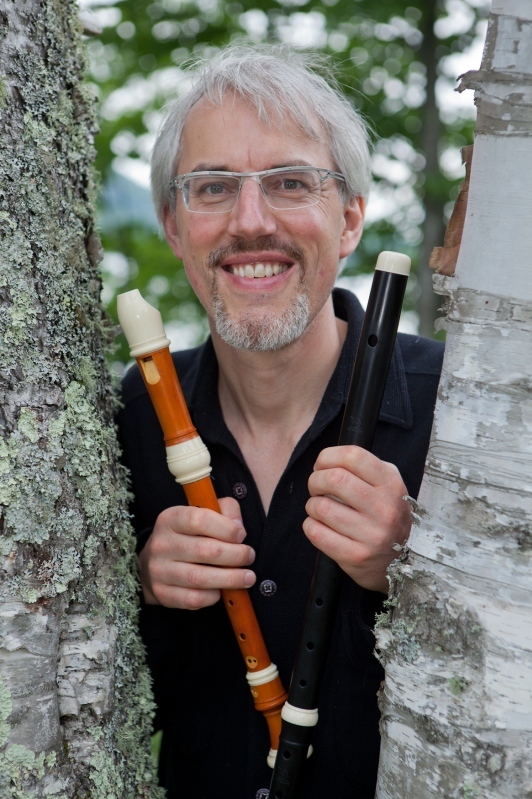 The concert selections also include solo works performed by Maute on recorder and traverso. As of this writing, four “Rallies” have taken place: in Portland, OR, Seattle, WA, Palo Alto, CA and Denver, CO. 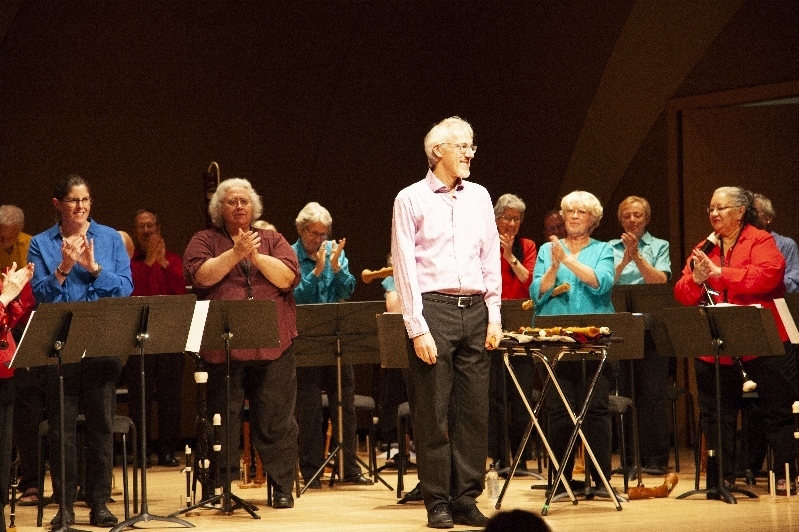 The American Recorder Rally in Seattle, an event to "show the astounding qualities of our favorite instrument, the recorder," to quote Matthias Maute, featured him as conductor, recitalist and soloist with a recorder orchestra. Although the members of the orchestra received music for a suite by Schien and a concerto by Maute prior to the rehearsal, they had only 2 hours with Maute -- minus an 8 minute break! So it was a fast-paced rehearsal, according to several participants. Having been told in advance to choose and practice a part but also to be prepared to play another part, some participants did just that -- played another part to ensure balance among the parts. 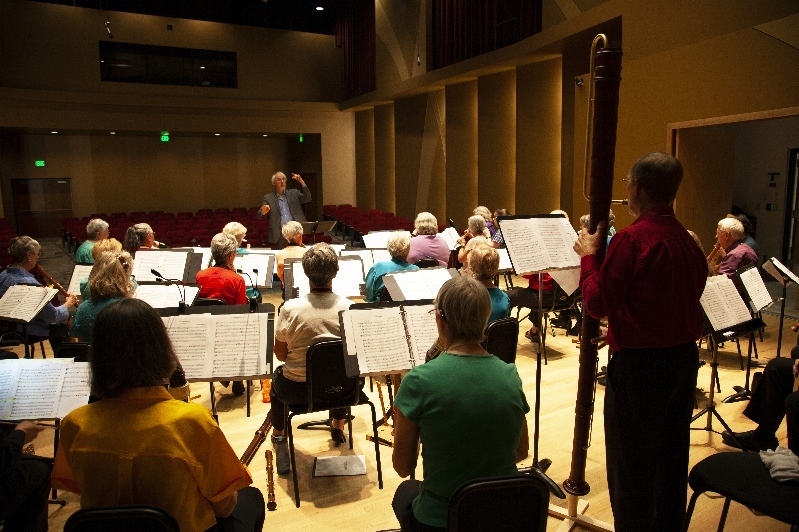 Maute encouraged members of the orchestra to play 'as one,' especially at the beginning and end of phrases and to contrast staccato and legato within phrases. 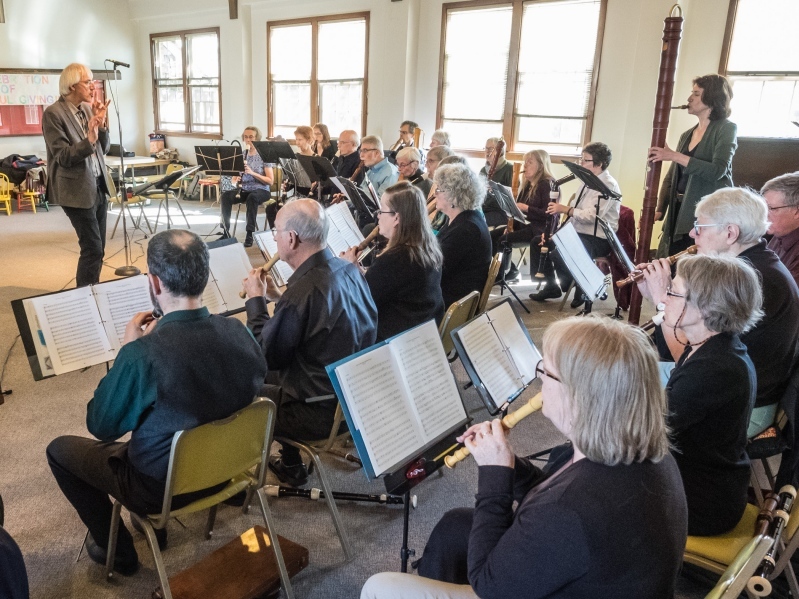 The members of this orchestra also heard what anyone who's played a recorder with Maute as a conductor has heard him say: "A note that should be short can never be too short and pianissimo can never be too soft!" The orchestra opened the concert with Suite 13 in g minor from Johann Hermann Schein's Banchetto Musicale, showing excellent results from their short rehearsal. Each of the five polyphonic dance movements displayed distinct character, very good intonation, different and appropriate articulations, variation in dynamics and a variety of musical colors. 'Short' short notes and 'soft' soft notes were evident throughout! The middle section of the program was a stunning solo recital by Maute that took the audience through music from the late Middle Ages through today. Entitled #Telemann: Twitter and Tweets, six sets were comprised of a fantasia by Telemann framed by pieces by other composers and introduced by stories about Telemann or the composers. Although twitters and tweets bring birdsong as well as a contemporary mode of communication to mind, the virtuosity and artistic skills of Maute on various recorders were amply displayed. Each set had a title, related in some way to Telemann's life, with a fantasia that turned out to be appropriate to it as well as by other composers. Some examples follow. The set 'Lost Love,' acknowledging that Telemann's beloved first wife died giving birth to their second child, included Machaut's J'aime la fleur. Another set recognized that Telemann, music director at five (!) churches had to walk to each of them -- even in ankle-deep mud in a city with no proper streets or sidewalks. Maute played one of his own compositions in that set, an excerpt from 4 Seasons and a Melting Iceberg. Who would've thought that a song from 1932 would be a complement to a Telemann Fantasia and one of Van Eyck's bird songs? Maute thought so, playing a lovely ornamented version of Fascination -- without the final note -- from the film, Love in the Afternoon, which starred Ingrid Bergman. Telemann maintained friendships with other composers, including G.F. Handel, who lived in London. When he was an old man, Telemann took up gardening and especially enjoyed growing flowers. Handel sent him flowers from London, including new and rare types. The last set included A New Scotch Tune by Henry Purcell. It was a wonderful experience to hear the fantasias by Telemann juxtaposed against pieces by other well-known and not so well known composers. 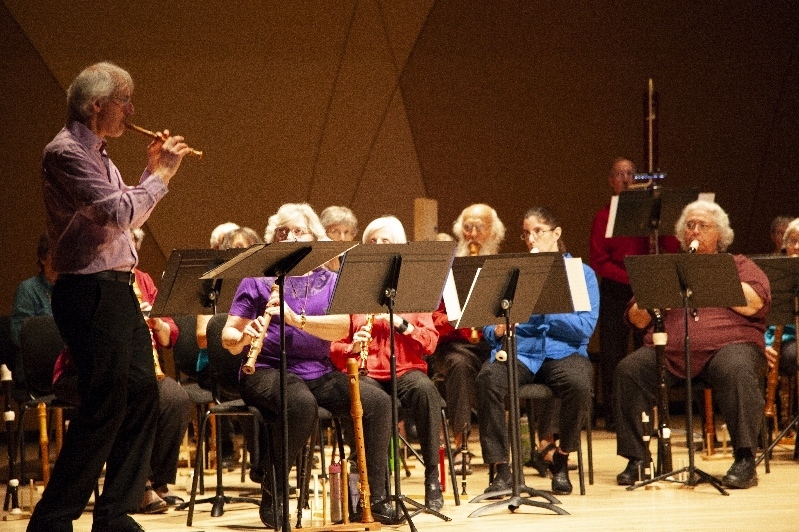 The finale of the American Recorder Rally in Seattle was the newly-composed Concerto for Recorder and Recorder Orchestra by Maute -- and a 'grande finale' it was. The concerto has three movements: I, Allegro; II. Oy Dortn; and III. Hola!. The percussive rhythmic sections in the two fast movements showed off the considerable virtuosity of Maute as soloist and challenged the members of the orchestra because the solo line and the accompanying orchestra parts all had percussive rhythms. The lament in the second movement was truly melancholy, based as it is on an old Yiddish folk song about lovers having to part, knowing this will be the last time they'll see each other. The third movement demands a virtuoso player -- but it is also vibrant and extremely interesting. Maute interwove the extremely fast solo line so that it that shimmered above the accompanying orchestra. He demonstrated his own admonitions to the orchestra, too, with variations in dynamics, great expressiveness, really short notes, and occasional legato. The orchestra accompanied him in fine form, including responding to a cue from Maute's elbow! 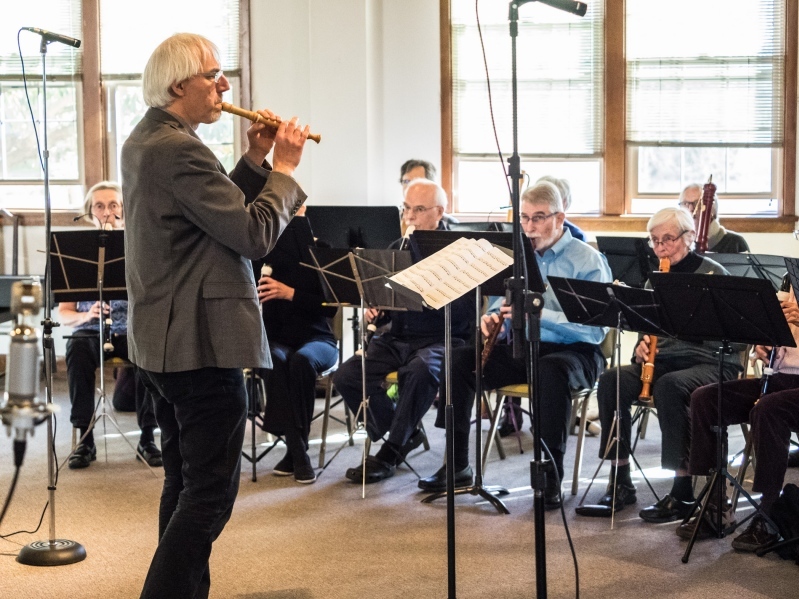 The Concerto for Recorder and Recorder Orchestra was written for the American Recorder Society and is dedicated to Nancy Gorbman, who was integral to developing the American Recorder Rally with Matthias Maute. The Matthias Maute workshop and concert were wonderful. In addition to his virtuosic recorder talents, he is a very talented conductor. He is very intense, knows exactly what he wants from the group and knows exactly how to convey what he wants very quickly. Very very quickly. (Those who participated know what I mean!!) I was impressed at the speed with which he let us know specific articulations, and the differences those changes made. Even more impressive was his recorder performances. He is an incredible virtuoso!! If you ever have a chance to hear him perform, whether in person or in a recording, please take the time to listen. He is truly amazing.